Let's finish off today's national day coverage in a sparkly fashion, shall we? We shall. (Stupid question, I know.) The national day gala brought out a plentora of tiaras and other sparkling things, but first let's get our facts out of the way: Invited were members of the government, the bureau of the Chamber of Deputies, the Council of State, representatives of the judiciary, heads of the administration and foreign ambassadors - and that's all hard facts this post needs, because I seriously get distracted by shiny things. So let's have a quick tiara rundown: It was the Belgian Scroll Tiara for the leading lady of the evening, Grand Duchess Maria Teresa. Hereditary Grand Duchess Stéphanie got out that still kinda mysterious Diamond Butterfly Tiara , which she debuted two years ago. And the three other ladies all debuted new-to-them tiaras. (Gotta love them!) Princess Claire wore the Grand Duchess Adelaide Tiara, Princess Tessy opted for the Diamond Vines Leaves Tiara and Princess Alexandra for the Chaumet Diamond Choker Tiara - and they all seemed to have an awfully good time doing so. And no, I'm not going to ask what happened in the following picture. 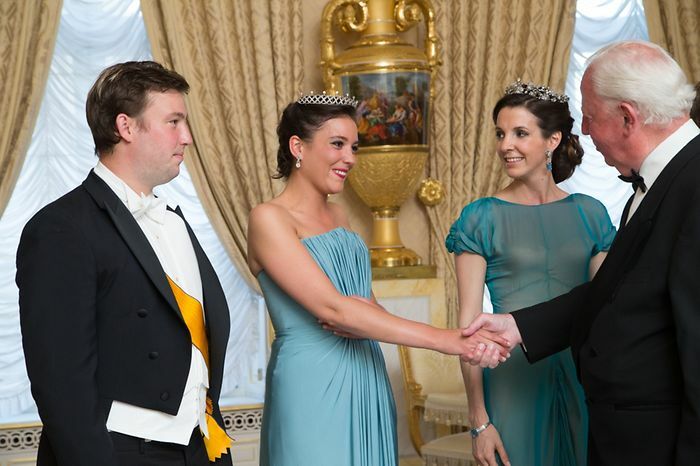 In related news, Princess Tessy sported another design by Marcin Lobacz. She really did take the Nassau colours and ran home with them. Even though the shoes may be a tad much, I have a really soft spot for her dress. Can't you just imagine gliding down the stairs and twirling around that one in the palais?! Hereditary Grand Duchess Stéphanie wore a Paule Ka gown (with thanks to European Royals Fashion on Twitter). 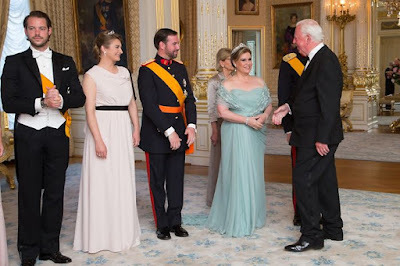 It was seemingly also the national day of repeats: Grand Duchess Maria Teresa's gown seems to be the same Elie Saab one from Crown Princess Victoria's wedding. Princess Claire's dress is a double repeat, not just from the recent Ligne/Dampierre wedding but also from the Borromeo/Casiraghi wedding last year. And yes, the gentlemen also looked dashing in their uniforms and white tie. More lovely pictures of the evening at Wort and Tageblatt. Also, for more on the days events, check our posts on the official ceremony, the military parade and the Te Deum.